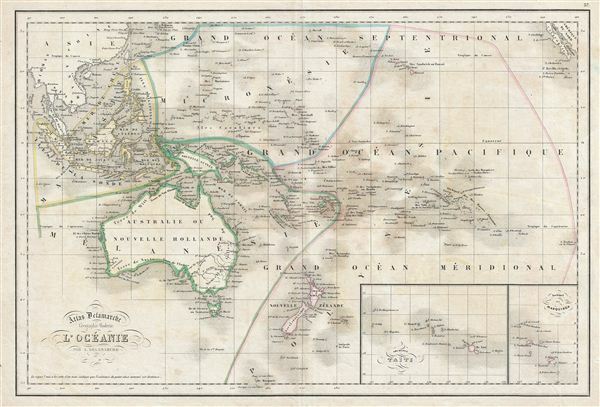 This is a beautiful example of Alexandre Delamarche's 1850 map of Australia and Polynesia. It covers Australia, New Zealand, Polynesia, Micronesia, Melanesia and Malaysia. The Hawaiian archipelago is identified as the Sandwich Islands. Two inset maps in the lower right quadrant detail the Tahiti group and the Marquesas Islands. Throughout, the map identifies various cities, towns, rivers, mountain passes and an assortment of additional topographical details. Political and regional borders are highlighted in outline color. This map was issued by Delamarche as plate no. 37 in his Atlas Delamarche Geographie Modern. Very good. Some wear on original centerfold. Blank on verso.